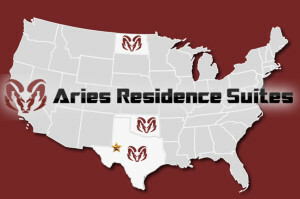 Our amazing client Aries Residence Suites opened another extended stay location and we helped make sure people knew about it via online marketing and SEO! The low-down: Aries Residence Suites recently hosted the grand re-opening of their Aries Goldsmith Workforce Housing Lodge located in Goldsmith, TX just outside of the Midland/Odessa area. The Goldsmith Workforce Housing Lodge offers fully furnished private suites, so all you need to do is bring your suitcase. Aries provides guests with everything one could need in terms of living amenities, and even includes housekeeping every week and on-site management to make sure guests remain as comfortable as possible.View full Aries Goldsmith Lodge brochure HERE.